Well, that sure didn't work out as planned. Google pulled the plug on its home page background experiment Thursday, just hours after the day-long endeavor began. The G-Team had planned on featuring different images in the background of google.com for a full 24 hours, a move meant to show off the company's new customizable background option. When it became clear people weren't pleased with the home page change, Google decided to press the "undo" button early. It turns out, though, the growing user backlash was only part of the problem. The backlash started early. With elaborate background images in place, Google's home page suddenly bore a remarkable resemblance to the busy look of Bing, the third-place search engine owned by Microsoft. The shift was a jarring change from Google's typical simple look, as evidenced by the pages of angry and often amusing remarks sent on Twitter. "WHY does GOOGLE have a background IMAGE?!!!!! WHY?!!!!!" wrote one particularly distressed tweeter. Still, to its credit, Google listened to the masses. Early in the afternoon, the Google home page background image vanished, and the standard white screen we all know reappeared in its place. According to Google Search VP Marissa Mayer, a software bug was the actual underlying problem. "We had planned to run an explanation of the showcase alongside it, in the form of a link on our home page," Mayer explains. "Due to a bug, the explanatory link did not appear for most users. As a result, many people thought we had permanently changed our home page." So the world is back as it should be: Google is simple and white, Bing has its "lost background image" back, and everyone is happy. There's one group of people left out in this resolution: the folks who actually liked the photo-friendly edition of Google. If you're part of that minority, you don't have to feel like you got the short end of the stick. The on-by-default Google home page background, as I mentioned, was never meant to be a long-term feature. But with a couple quick steps, you can bring the magic back permanently with your own personalized Google home page. Simply sign into Google, using the link at the top right of the main home page. (If you don't already have a Google account, you'll need to create one.) Then, head back to google.com and look for a link at the bottom left of the page that says "Change background image." If you're already using iGoogle, you'll need to switch to the "classic home" view first. 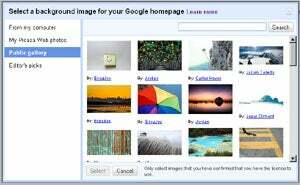 From there, you can opt to upload your own custom background image or select from any number of publicly available images ready for your approval. Try using the search box within the "Public Gallery" section; you'll find all sorts of stuff. If you're a rabid Apple or Android fanboy, for example, try searching for "Steve Jobs" or "Sergey Brin" (yes, there really are background images available for both). If the "Developers!" dance is your thing, search for "Steve Ballmer" and you'll find Mr. Microsoft himself posed and waiting for your click. There's something for almost every interest imaginable -- even competitive polka dancing and gourmet bread making (trust me, I checked). For a more robust custom Google home page experience, click over to iGoogle. That service lets you build your own Google home page from scratch: You can add news and weather widgets, boxes with your favorite RSS feeds, and even live functioning games and applications. Or you can always just stick with the plain and simple classic white Google look. The world of tech is ever-evolving, but some things never go out of style.